In homage to 80s fashion visionary Maria Blaisse, Gary Card recreates her signature extreme shapes together with photography by Jason Kibbler and styling by Karen Langley. The Dazed August issue went back to the 80s for otherworldly fashion that looked towards the quiet legends that have been making an impact on fashion for decades without people realising it. Dutch designer Maria Blaisse is one of those legends. She began in the early 80s' by creating spherical foam forms that moulded and folded in ways that were revolutionary at the time and she worked primarily in dance wear where she is still breaking new ground today. Blaisse then went on to collaborate with Issey Miyake for whom she made mitre-like rubber hats. For the August issue, Karen Langley was inspired by Blaisse's work and re-interpreted her sculptural feats with the help of set designer Gary Card and photographer Jason Kibbler. We speak to Blaisse to see what she makes of the reinterpretation and how her work still permeates fashion today. What do you think of the images and how Karen Langley and Gary Card interpreted your work? I like the images best when my work is interpreted in other materials. The most clear are no. 1, 2 and 8 (I like the idea of the black padded bathing suit). How did your sensibility as a designer develop from the beginning? How did you become so involved with incorporating shape into your designs? How do you balance wearability in your costume designs, especially considering the dancers have to move vigorously? Where do you think you sit in between fashion, sculpture, artist and professor? I am just in the middle of these worlds. They inspire each other. Do you see your work echoed in contemporary designers today? I know that the designers that are inspired my work, work more directly and simply. At the moment I am working with bamboo forms based on one flexible structure with dancers. You can see the photos on my website. These structures will be enlarged in collaboration with the structural engineering company Arup / London into flexible pavilions. and I just designed the C-shoe for the Camper toðer project. In September they will be in red, blue, white, brown and black in the shops. What reference points from Maria Blaisse's work did you use to construct your pieces? Karen Langley sent me a few photos of Maria Blaisse's work and simply told me to re-interpret them how I saw fit. The important thing was to keep a balance between respectfully referencing without directly copying her. For me the biggest challenge was 'the spike dress', it was a really key piece so I wanted to give it a lot of attention. It took about 20 hours to construct. 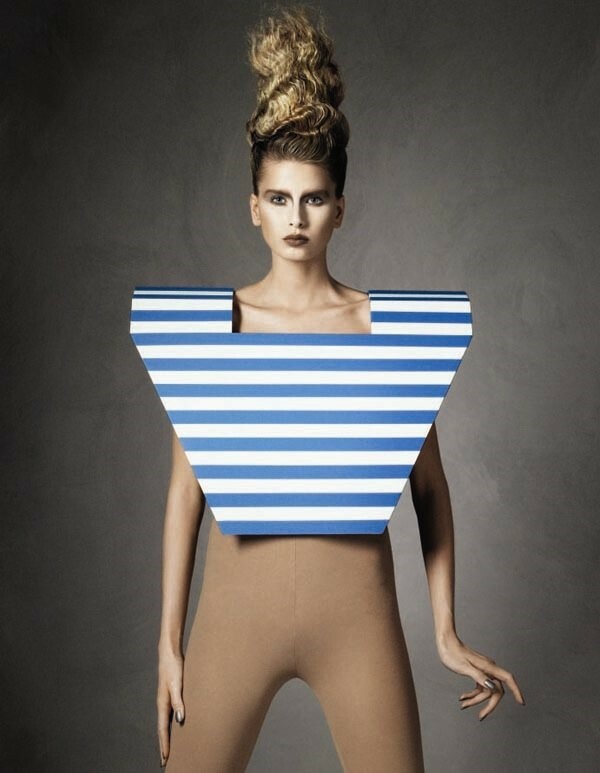 Your work has been used in many fashion contexts now; do you see yourself progressing onto 'wearable' cardboard pieces? I've been asked this a lot recently and it's something I've always thought about and I'd absolutely love to explore the idea in the future. Me and my boyfriend always talk about one day becoming a Victor and Rolf style duo, so who knows, I've got such a strange career right now it could really go anywhere. This week I'm working on a very exciting project with 'Matches' for fashion week, customizing some instruments for Lady Gaga and making some costume pieces for a Steven Klein shoot with Nicola Formichetti.